Good point. It’s indeed not built into the “base” of R. It is, however, fairly simple to build a function that computes it for you (see, e.g., here). Once that’s done (a one-off effort), it is straightforward to compute omega2. Hello, congratulations for the blog! I have a question..I am comparing the cellular behavior over three different ceramic material. I have 4 variables of cellular metric parameters; N=49. None of them are parametric, and 3 have heteroscedasticity (so I applied Welch’s ANOVA) but the 4th variable has homoscedasticity but does not have the same distribution over the 3 groups, or in other words, can’t apply Kruskal Wallis.. Which statistical analysis should I apply? 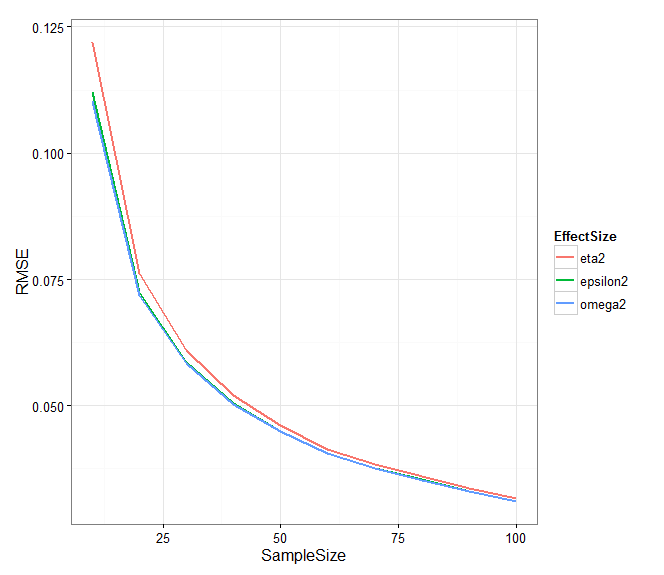 How can I calculate effect size? Thank you very much.